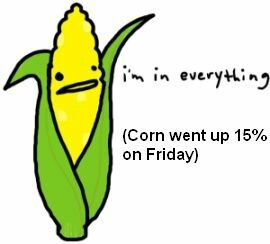 Did you notice that corn prices vaulted ahead 15% on Friday? If you are a middle class or poor American, you will notice soon when these price increases filter through the food chain. Corn is a staple of the diet of most Americans – not in its direct form, but as a feedstock for cattle and chickens, and of course as the basis for High Fructose Corn Syrup, which is found in most fast food and snacks. Poor people especially live off fast food and snacks, so price inflation of any food staple hits them hardest of all. Who if anybody is responsible for this? Normally you can chalk up commodity price increases to general market forces, and there was an announcement this week from the Department of Agriculture that the corn crop is now going to be 4% lower than previous estimates. That surprised the corn traders, but it doesn’t explain why there were nearly equivalent increases in the prices for coffee and sugar, or why gold set a record high price this week. Commodities of all sorts have been a hot ticket for traders all this year, and it isn’t just shortages or demand from China and India that are propelling prices forward. It’s cheap money, and lots of it, and lots more to come, judging from market expectations for more Quantitative Easing from the Federal Reserve. The first round of Quantitative Easing took place throughout last year, as the Fed bought up distressed mortgage-backed securities from banks in exchange for cash. This new round is going to be different: the Fed is expected to buy Treasury securities directly from the large banks that are required to purchase these securities at Treasury auctions. Market estimates range from $500 billion to $2 trillion in staggered purchases over the next year, and at the higher end of that range, the Fed would be financing the entire expected federal budget deficit for 2011. When a central bank buys securities issued from its own government, bad things usually happen. Any country which issues government securities should be expected to sell these securities on the open market. This means the net flow of cash in the system stays the same: buyers of these securities use existing pools of their own cash, or sell some other asset in order to buy the new security issue. But a central bank can create money out of nowhere, and this is new cash injected into the system when they buy their own government securities. This is called “monetizing the debt.” Depending on the amount of new cash put into the economy, inflation can result, and in some historical cases hyperinflation may occur (see Zimbabwe for a recent example). The Fed’s experiment in Quantitative Easing is unprecedented in the amounts of new cash being put into the global financial markets. The first QE round took the Fed balance sheet of securities from $800 billion to $2.2 trillion, and QE2 could double this amount. All this fresh liquidity is not going where the Fed anticipates, which is to businesses and individuals seeking credit that ultimately will help solidify an economic expansion. This liquidity is instead going into commodity markets, gold and silver, junk bonds, mergers and acquisitions, and stocks, and some of it stays invested in Treasuries, helping drive down yields on 2, 10, and 20 year Treasuries to record lows. What we are seeing out of Ben Bernanke is what we saw from Alan Greenspan, the previous Fed chairman, who never met an asset bubble he didn’t like. Greenspan is doing the rounds of the lecture circuit telling everyone how important it is to keep the stock market moving higher. This will excite the animal spirits in the economy and induce people to spend money. Ben Bernanke doesn’t give this same speech, but every move he makes follows this Greenspan prescription for economic health. The Fed announces in advance when it is doing a QE transaction, and you can now observe a correlation to the day when this fresh money is put into the system, and the performance of the US stock market. For every $5 or $10 billion of new money given to the banks, the stock market moves up that day or the next. This explains in part why the Dow Jones Index has rocketed forward day after day since the start of September. Whether the Fed is indirectly goosing the stock market, or whether this is just an unintended consequence of its QE2 program, doesn’t really matter. No one dares stand against the Fed. Short positions are being liquidated in the face of relentless price increases. The put call ratio has fallen to the sort of levels one sees at market tops (in other words, traders are more heavily invested in calls, expecting the market to go up, than in puts). Volume has fallen off sharply in this advance, especially from Mom and Pop retail investors, who have been liquidating their shares week after week all year long because they are afraid of another Flash Crash, or because they need the money just to survive. You can almost smell the unhealthiness of this stock market. The correlation among all stocks is at a record high; on any particular day 80% of the stocks trade in the same direction. This situation has gotten so bad that hedge funds are moving out of the stock market, because there are no stocks that serve as hedges since they all go up or down together. The correlation among stocks used to exist on a measurable basis a few days into the future; now the correlation can be measured minute to minute, a function of the High Frequency Trading done by computer. This HFT activity is at least 40% of the daily volume going through the market. Lately, of the 17,000 stocks that trade on US markets, about 120 of them constitute 60% of all volume, which is a highly unusual concentration of risk in so few names that are dominating the market. In the NASDAQ 100 index, 20% of the price moves on any particular day can be explained by what happens in just one stock – Apple. In the Dow most of the daily price change can be explained by Caterpillar, because this stock trades over $80/share and the Dow Jones is weighted in such a way that high priced stocks dominate the index result. A number of stocks like Apple, Netflix, and BAIDU (the Chinese internet company) have gone parabolic, meaning recent price changes have been nearly vertical on the charts. We haven’t seen situations like this since the NASDAQ peak in 1999. This stock market is more narrowly focused, more computer driven, less supported by retail investors, and more frenzied despite low volumes, than ever before. This same situation exists in stock markets in Europe and Asia, and especially in favored developing countries. The situation is mirrored in the commodities, precious metals, junk debt, and other markets, which tells us that we are rapidly moving into asset bubbles in many markets. We have all lived through this before, first during the technology stock bubble of the 1990s, and then the real estate bubble that burst in 2007. To show you just how much reality doesn’t matter much to these markets, major US bank stocks have been going up all week. This despite the fact that the major banks – Citigroup, JP Morgan Chase, Bank of America, Wells Fargo, and others – have taken a body blow that could well be fatal. They have lost access to their collateral supporting residential mortgages, because the foreclosure scandal has pretty much shut down the ability of banks to secure and sell this collateral. Considering the size of these portfolios when compared to bank capital, you can see instantly that these banks are insolvent if this situation persists for more than a few months. In any market where reality mattered, bank stocks would be down at least 50% with this news. In this market no one cares, because the Fed is always there to save the day. It’s odd to hear traders talk these days about the market. Everyone is long this and long that, but no one is happy with their position. They worry about the inflationary implications of what the Fed is doing, and not a small number of traders and analysts are predicting hyperinflation for the United States down the road. This is why so many people are buying gold, even in physical form like coins, because they think it will be the only asset to maintain its value in hyperinflation. Most of all people are nervous about the future, because the QE2 program is a massive experiment that could backfire and destroy the US economy. This isn’t just idle trader chatter; respectable members of the financial establishment, and even some Fed governors, are saying the same thing. Normally Fed policy moves are discussed in secrecy and the vote is nearly always unanimous, because no one at the Fed wants to go against the Chairman of the Board. Not this time. The stakes are way too high, and Fed governors as well as the presidents of the 12 regional Fed banks are weighing in publicly on the merits of QE2. The vote at the next meeting of the Fed’s Open Market Committee, which decides monetary policy, will take place November 2-3, and it is not likely to be unanimous. Ben Bernanke tries to give the pros and cons of whether QE2 should be implemented, but there is no doubt he is in favor of it. Other high officials at the Fed are too. William Dudley, President of the NY Fed, has spoken publicly in favor of QE2 in the past week, and one of his lieutenants, the executive responsible for implementing the Quantitative Easing programs, took the unusual step of giving a speech explaining how these programs really help the economy and are necessary in times of weak economic growth. Usually Fed managers keep their mouth shut. There are now several Fed governors or presidents who have said they are opposed to QE2. There are not enough of them to prevent the program yet, but you get the sense they are trying to stop something disastrous from happening. Many of them worry publicly about inflation down the road, and they say they do not see a pressing need for QE2 at the moment. The economy is not in a free fall as it was in 2008 when QE1 was implemented. The unemployment report that came out this week showed a continuation of high unemployment and feeble job growth, but that is still reflecting an economy that is growing slowly. These Fed officials might be willing to vote in favor of QE2, but only if the economy starts to sink rapidly again. Ben Bernanke probably doesn’t have this luxury. He’s in the hot seat, subject to pressure from the White House, Congress, and the media. People are clamoring for him to “Do Something!”, especially in an election year when voters are overwhelmingly worried about jobs. He no doubt hears the desperation in the voices of politicians from both parties, since the anti-incumbent mood is especially strong this year and reflects a disillusionment by many voters with the “establishment” running things. Along with all these cries for help is an expectation that the Fed will save us from economic disaster, and this is an expectation that the Fed itself has fostered over many years as an institution that has magical levers over the economy that can keep it humming along and recessions brief and shallow. The financial markets are particularly prone to depending on the Fed for rescue in tough times. This was known as the Greenspan put under his tenure, and it reflected the belief, born by experience, that in a market crisis Uncle Al would open up the monetary spigots and save us all. Now the markets call it the Bernanke put, but the Bernanke put is much more potent because he has shown that all the big players in the market are Too Big To Fail. Plus, Ben Bernanke has made his reputation as an expert on the Great Depression of the 1930s, and he is assumed to have some special insight into deflation and depressions that will prevent something like this happening again in the US. Is the Fed all-powerful, or is this just an illusion? In the past the Fed loved to operate in secrecy and give the impression it had God-like abilities to move the economy this way or that. Occasionally the Fed Chairman would remind people that the central bank could only directly influence short term interest rates, and didn’t really have the omnipotence people assumed, but there is no doubt that the culture of the institution fostered the idea that Fed officials and staffers were way smarter than the public and didn’t really have to explain themselves even to Congressmen. These days, the Fed can no longer protest that it only manipulates short term interest rates, because the Quantitative Easing programs are designed specifically to push long term interest rates lower. The Fed has been buying mortgage backed securities with maturities from 2 to 10 years, and this has clearly pushed mortgage rates in the US to record low levels. A QE2 program would no doubt be concentrated in the same part of the maturity spectrum for Treasury securities, and in anticipation of this, the bond market has already pushed interest yields on these securities to record low levels as well. Interestingly, the Fed will not be buying too many Treasury securities with maturities beyond 10 years, because there are so few. Data released this week by the Treasury shows that of the many trillions of dollars of Federal public debt that is in the market, only about $500 billion has a maturity greater than 10 years. The Treasury used to issue 30 year bonds, but hasn’t done that in years as part of a specific program to concentrate government borrowing in the short end of the maturity spectrum. And why not, when interest rates for money from 2 to 5 years maturity are so low? The reason why a government should not do this is because it can find itself trapped, and that is exactly what has happened to the Treasury and the Fed, in turn. The trap works like this: when interest rates get very low, a government can borrow enormous amounts as long as its credit is good. The total interest cost on the debt will be modest no matter how much it borrows. This is especially true when its central bank operates a Zero Interest Rate Policy, like the Fed is doing, which has pushed short term rates to zero and is implementing Quantitative Easing to get the same result for long term interest rates. But if too much is borrowed, the government finds itself trapped because it cannot then allow interest rates to rise. This is the situation the US is in now. The public debt accelerated sharply under the Bush administration, to $10 trillion, and has ballooned further under Barack Obama’s stimulus program to $14 trillion. Obama is adding $2 trillion a year to the debt, when just a few years ago the annual deficit was about $400 billion ( not counting the cost of two wars). At $14 trillion, with interest rates close to zero, the cost of servicing the debt interest is running from 5% to 10% of total federal government expenditures. This is a manageable amount, serviceable still by income and other taxes that come into the government. But if interest rates were allowed to get back to levels seen in 2007 before the credit crisis, the interest burden would jump up to about 40% of total government expenditures, and something would have to give, probably involving cutbacks in Social Security, Medicare, or defense spending, the Big 3 of the budget (by that point there would be a Big 4, counting the cost of paying interest). If rates were to reach 5% p.a., interest costs would eat up nearly 100% of all federal government revenues, crowding out everything else, or otherwise forcing the government to default on its debt. It’s not too long ago that long term yields on Treasuries were at 5%, but it is impossible to imagine that the US could afford to pay such a rate today. There are several traps the US has now set for itself. There is the debt trap just described, and there is the rollover trap that occurs because the US has concentrated so much of its debt in the short term. It must roll over this debt constantly, exposing itself to interest rates shocks at every rollover event. A third trap is the classic liquidity trap that central banks find themselves in during depressions, when the central bank runs out of tools to generate economic growth. The Fed is already facing a liquidity trap, which is why it is somewhat ludicrous to hear them talk about how much more economic growth we could get if interest rates were lowered from 0.5% p.a. to 0.25% p.a. Ben Bernanke must know all this, or he shouldn’t be in his job as Fed Chairman. Anybody can spend two minutes calculating 5% on $14 trillion, or $16 trillion if you want to use the debt level already cooked in for 2011, and see that the US is trapped. It cannot afford to allow interest rates to approach anywhere near this level. Such an event would force a default, which would probably involve paying interest not with cash but with even more debt, or the US would be required to slash almost to nothing its most treasured social and defense programs, throwing the economy into a far worse depression than experienced in the 1930s. Ben Bernanke must know all this. Maybe he also knows that his hands are tied in other ways. People are expecting him to Do Something, to Save Us All from a dreadful economic fate, and therefore whatever the debates of the merits of QE2, he has to try it just to avoid the criticism that the Fed did nothing while the economy burned to the ground. You do have to wonder, though, whether Bernanke realizes the mess he is really in, and the problems he has already caused. Perhaps this week’s trading might alarm him to the awfulness of his situation, since a 15% one day move in an important commodity is no everyday thing. He should certainly be able to survey one asset market after another and understand that cheap, nearly unlimited liquidity is firing up animal spirits in all the wrong places. He is already at risk of being known as every bit the serial bubble blower as Alan Greenspan. Does he really know the devastation his zero interest rate policy has caused investors and savers in the US, especially retired people, and insurance companies or other firms that are relying on traditional long term interest yields of 5% to fund their policy payouts? ZIRP, as it is called, has penalized the very people the US should be encouraging – those who save money. ZIRP has also devastated the US dollar on the foreign exchange markets, making it appear as a deliberate policy of the United States to engineer the dollar’s exchange rates lower in order to boost exports. This is precisely the sort of competitive devaluation situation that made the 1930s depression so much worse. Most of all, does Ben Bernanke make any connection between the asset bubble in a commodity like corn, and the economic pressures this creates for the middle class or poor people? Given their lofty and isolated position, and the fact that Fed officials talk only to businessmen and millionaires in Congress, one of the things most lacking in Fed policy debates, public or private, is any concern for the average person in the US. It’s as if these are the people of least concern to the Fed, or if they are of concern, it is only as economic factors in econometric models. You get the impression that the Fed has, for a long long time, forgotten about the real, and often immediate personal consequences its policies have for the average person. No wonder someone like Nicholas Taleb, famous for his book about Black Swan events, said this week that in ten years or so the Fed will no longer exist. This is because the crisis facing the United States is indeed an existential crisis, and the institutions which fail the greatest challenge of their time often suffer existential consequences. All the QE2s will not matter one iota. The fact is that QE is pushing on a rope with interest rates. If you lower the rates to zero there is no borrowing because 1) banks won't lend and 2) people will not want to go into debt. Marginalization may be the greatest existential consequence. Federal Reserve of the future will provoke a universal yawn. There is just too much debt, too much housing, too much over-capacity of almost everthing world wide and until that changes QE will never work. That said, there are still shortages of important new tech in the energy patch. There is global hunger, disease and unemployment. Capacity is relative the the need and market. Financial stocks? In theory, they should be getting fatter by the day, but investors are avoiding them -- I think Goldman Sachs is below last year's price level. Yes, some PE contraction, but it has been range-bound all year. Bank of America -- don't ask. People seem to understand that they do not have the whole story. And yes, you can get more return on utilities, telcos, but regionals and national banks are not loved on Wall Street. Something is seriously wrong, and the Fed is not in full disclosure.